If you’re looking for a holiday corporate caterer for your office Christmas party, you know it’s a difficult task. At Shipley Do-Nuts, we like to step out of the norm for a donut shop. Our shop offers corporate catering in Houston to give you easy, delicious, and affordable food for you and your business. First off, all you need to say is the words “donut”. Whether you want glazed, frosting, or filled you get a sweet delicious treat. You don’t have to wait for breakfast to eat these yummy treats. 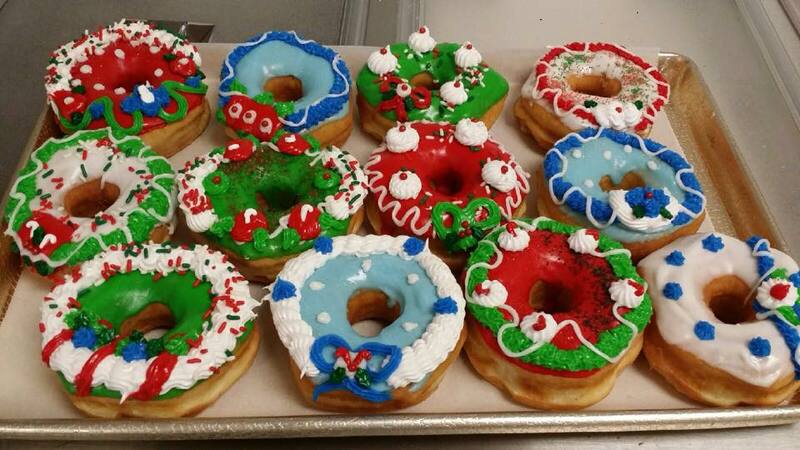 We can customize your donuts to make them as festive as possible to get your entire team in the holiday spirit. Fill the office party with delicious food by adding more sweetness to it. Get a holiday corporate caterer who keeps the party alive. If you thought donuts were enough, then think again. You can’t have an office Christmas party without Houston’s well-known kolaches. These bad boys are great for both large and small groups. Whether you’re in the mood for sausage and cheese or jalapeno and cheese, we serve your craving. With our different choices of kolaches, there’s options for everyone to enjoy. We know the holidays are a stressful time for everyone. From travel plans to gift shopping, chaos reigns this time of year. Your holiday office party should be more than just another day at work. Make your party a place where everyone can enjoy themselves. With the help of our breakfast catering services, we can take the edge off of the holiday stress. With the help of our food, we can bring everyone together for the holidays. We’ll do our best to help you forget the hectic holidays for a short period of time. After all, it’s a party, might as well enjoy it. As Michael Scott from “The Office” once said, “gifts are a great way to show you care”. Show your co-workers and employees how much you care with our mouth-watering treats. In case that you want to send your clients a gift, we can certainly make that happen. With us as your holiday corporate caterer, we offer logos to include your company information free of charge. In fact, nothing says “thank you” more than a box full of donuts. Give the gift of giving with your business. Check out our great business builder program for more details! We’re not saying you should throw the biggest or craziest party of all time, but maybe something people will remember. Unlike the new film “Office Christmas Party”, you don’t need to host an epic party to impress your potential clients. Our services will be enough to wow your business and potential clients. From delicious food to smiling faces, it’ll be a party to remember. Bring everyone together this holiday season with Shipley Do-Nuts. Call us now at (713) 589-3292 or order online to get started on your party planning today.